When the manufacturing method for ergocalciferol was created, binding studies of the vitamin D receptor in rats showed equipotency between ergocalciferol and cholecalciferol. On the basis of this animal data, most resources cite the two being equipotent and interchangeable. If ergocalciferol is less potent and has a shorter duration of effect, why is it used? The most likely reason is due to dosage formulations. Unlike cholecalciferol, which is typically only available as a maximum dose of 5,000 units per capsule or tablet, ergocalciferol is available as a monster 50,000 unit dose. This larger dose may be seen as more convenient for patients or healthcare providers who want to provide supplementation on a weekly or monthly basis. Although 25-hydroxyvitamin D levels are a better surrogate than a rat binding study, clinical outcomes are the most relevant. Low levels of 25-hydroxyvitamin D (less than 20 ng/mL; Bjelakovic 2014) are very common in North America and have been associated with a wide variety of diseases including osteoporosis, bone fractures, malignancy, cardiovascular disease, infections, and more. The majority of the data supports association, not causation, of low vitamin D levels. In other words, much of the data does not clearly support the idea that vitamin D supplementation in a patient with low vitamin D levels reduces the risk of these diseases. With that said, a recent Cochrane review (Bjelakovic 2014) analyzed the all-cause mortality benefit of vitamin D supplementation (both D2 and D3) by pooling 95,286 participants from 56 randomized clinical trials. In this meta-analysis, about 80% of participants received cholecalciferol (median dose 800 units/day) and about 20% received ergocalciferol (median 1000 units/day). The vast majority were women (77%), and most were older than 70 years of age. The Cochrane review calculated an all-cause mortality relative risk (RR) of 0.97 (95% CI 0.94-0.99, p=0.02), which represented a raw difference in mortality of 12.5% (control) vs. 12.7% (vitamin D). The authors calculated a number needed to treat (NNT) of 150 over five years; however, the NNT calculates to 500 over a weighted mean of 4.4 years using the raw difference in mortality rates. Importantly, the difference in mortality was only demonstrated for trials examining cholecalciferol. Although ergocalciferol did make up a minority of the meta-analysis, it was adequately powered to detect a 5% difference in relative risk reduction. Cholecalciferol (vitamin D3) is more potent and longer acting than ergocalciferol (vitamin D2) as measured by the active form of vitamin D in the blood (25-hydroxyvitamin D). Low vitamin D levels are common in North America; most data supports an association between low vitamin D levels and disease. Much less data supports a cause-and-effect relationship between vitamin D supplementation and prevention of specific diseases. Vitamin D supplementation with cholecalciferol (D3) appears to have a small but statistically significant benefit in improving all-cause mortality among elderly women. The mortality benefit in younger patients or male patients is not clear. Ergocalciferol (D2) is less studied than cholecalciferol and was not shown to confer a mortality benefit in a recent Cochrane meta-analysis despite adequate statistical power. For patients who meet criteria for vitamin D supplementation (which is an entire argument in itself), vitamin D3 (cholecalciferol) should be selected over vitamin D2 (ergocalciferol). Armas LA, Hollis BW, Heaney RP. Vitamin D2 is much less effective than vitamin D3 in humans. J Clin Endocrinol Metab. 2004 Nov;89(11):5387-91. PMID 15531486. Houghton LA, Vieth R. The case against ergocalciferol (vitamin D2) as a vitamin supplement. Am J Clin Nutr. 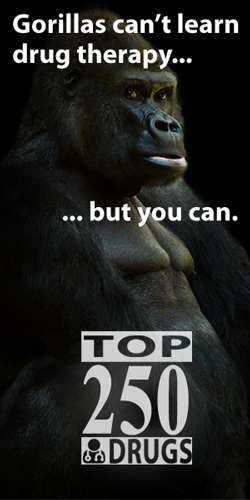 2006 Oct;84(4):694-7. PMID 17023693. Bjelakovic G, Gluud LL, Nikolova D, et al. Vitamin D supplementation for prevention of mortality in adults. Cochrane Database Syst Rev. 2014 Jan 10;1:CD007470. PMID 24414552. Interesting post! Are you still recommending Vitamin D in your ICU patients given the negative results from VITdal-ICU trial in JAMA? Definitely not — I do not recommend starting or even resuming vitamin D during critical illness in the ICU. The benefits of vitamin D supplementation are restricted to a small group of patients, but the use of vitamin D is often extrapolated inappropriately to a much larger group of patients. Even in the appropriate patient, vitamin D supplementation’s benefits are with chronic, long-term therapy — not a few days in the ICU. Can you give ERGOCALCIFEROL 50000 units weekly along with HOLECALCIFEROL (VIT D3) 1,000UNIT TAB daily? There’s no reason why you can’t combine D2 and D3, but I’m not sure why you would want to given the lack of data supporting ergocalciferol (D2). I’m unaware of any data suggesting that you combine both D2 and D3. See http://www.fda.gov/AboutFDA/Transparency/Basics/ucm194344.htm . The FDA does not approve dietary supplements. They state that the firms are responsible for their products. However, there are no standards for content, uniformity, dissolution, bioavailabilty, etc of These products do not meet the standards of prescription drug(orange book). 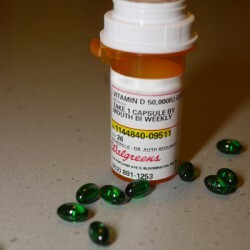 Furthermore the FDA states “Unlike drugs, supplements are not intended to treat, diagnose, prevent, or cure diseases.” see http://www.fda.gov/Food/DietarySupplements/ProductsIngredients/default.htm. I would not advise using over the counter cholecalciferol (50,000 units) in place of ergocalciferol 50,000 units (rx) for that very reason. You’re absolutely correct that there is much more regulation in prescription products than dietary supplements. 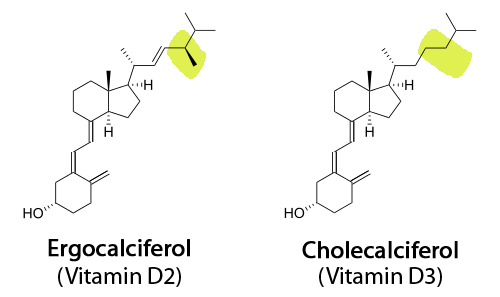 To some degree, organizations like USP (www.usp.org/usp-verification-services) have tried to provide a non-government verification/certification in lieu of the FDA providing approval for these types of supplements. In the case of vitamin D, you will definitely be able to find a USP-verified vitamin D OTC dietary supplement. Keep in mind, though, that for the vast majority of patients taking vitamin D, they aren’t taking it to diagnose/cure/treat/etc. — they’re taking it because their vitamin D level is low and their prescriber told them that they should take a supplement to arbitrarily increase this “low” number. There is a paucity of cause-and-effect data surrounding vitamin D supplementation, but an abundance of associative data regarding low vitamin D levels. What is the suggested dosage of D3, then, for a patient whose clinical level is ‘low’ and whose symptoms match those commonly associated with ‘vitamin D deficiency’? Is it 5000 units, or can/should multiple tablets be taken until blood level normalizes? There are clinical practice guidelines (Evaluation, treatment, and prevention of vitamin D deficiency: an Endocrine Society clinical practice guideline.) for vitamin D deficiency. Although I don’t fully agree with the recommendations (such as no preference given between ergocalciferol and cholecalciferol), these guidelines recommend a dose of 50,000 IU weekly or 6,000 IU daily x 8 weeks until 25(OH)D levels are above 30 ng/mL, then 1500-2000 IU daily for maintenance therapy. From my point of view, consider that patients rarely have “symptoms” of vitamin D deficiency. Vitamin D supplementation is usually given for prevention (like in osteoporosis) or because a blood level is checked and happens to be low (in a patient with no specific symptoms of deficiency). Of course, patients with chronic kidney disease are a different story because vitamin D is involved in calcium, phosphorus, PTH, and bone mineral density homeostasis (which is abnormal due to CKD). Within the “Vitamin D supplementation for prevention of mortality in adults” Cochrane review, most studies investigated vitamin D3 given once daily (versus intermittently – such as weekly or monthly). The mean dose in these trial was 3,650 IU daily, but the median dose was 800 IU (some trials used extremely high doses, which drove the mean daily dose up quite a bit). In short, the “recommended” dose of cholecalciferol depends on why you’re giving vitamin D, what endpoints you want to modify, and how quickly you want to achieve a “therapeutic” vitamin D level. There is no one single source or randomized controlled trial to inform the dosing regimen or decision. Is Vitamin D2 effective in combination with calcium, to help with absorption? It’s included, for instance, in some Red Algae supplements. Please note that cholecalciferol is available in 50,000 IU as well and is stocked in most pharmacies. Kane SP. It’s Time to Say “Goodbye” to Vitamin D2 (ergocalciferol). 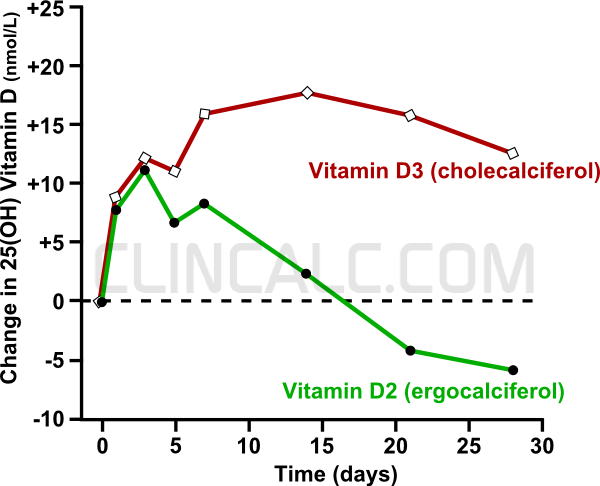 ClinCalc: https://clincalc.com/blog/2015/07/vitamin-d2-ergocalciferol-vs-d3-cholecalciferol/. Updated July 19, 2015. Accessed April 23, 2019.